Ah, Google – always keeping us on our toes and scratching our heads. With the evolution of Google Places it seemed as though Google was all for the local business – you could say even looking out for the little guy. However, the recent roll out of ads placed in Google Maps info bubbles makes you raise an eyebrow. Not only is Google placing an ad right within your perfectly optimized business information – in some instances the Google algorithm shouts its flaws loud and clear. As Mike Blumenthal posted, there have been several sightings of straight up inappropriate ad matches. In my own search I came up with several situations were the correlation between map listing and ad left me with a blank stare. 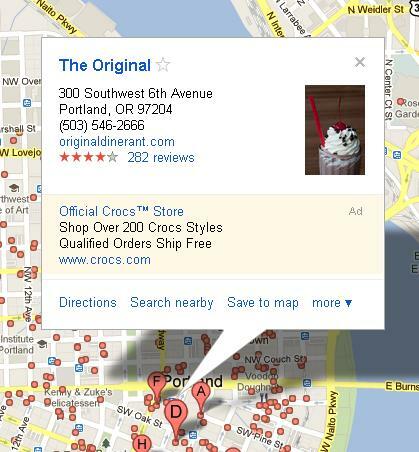 For example, below shows a bubble for a restaurant here in Portland – and what do I get as my ad? Crocs. I don’t know about you, but I know when I’m looking for a delicious place to eat I’m not really thinking about shoes. So what does this mean for small business owners? Well, technically your competitors can now target you more directly than they ever could before. In this situation you are left with minimal options – either fight fire with fire or hope that Google sees the error in their ways and stops these types of ads all together. In the meantime, I’d continue to focus on optimizing your local listings and look into PPC advertising if you haven’t already…my guess is that it’s only going to get uglier out there in the battle to be on top.